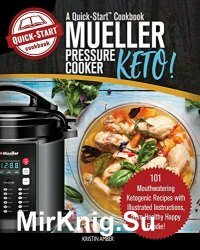 GET MORE FROM YOUR MUELLER PRESSURE COOKER - clear instructions with photos and illustrations so you can spend your time eating delicious keto meals instead of reading and researching how! MAKE YOUR FIRST MEAL IN 10 MINUTES - our unique “10 Minute Quick-Start” chapter will guide you through your first delicious meal with the Mueller Pressure Cooker, using clear, easy instructions with photos! LEARN WORKAROUNDS - to overcome common problems with the Mueller Pressure Cooker, such as sealing rings that take on the smell of spicy food, what to do if you release the steam too quickly, etc. !